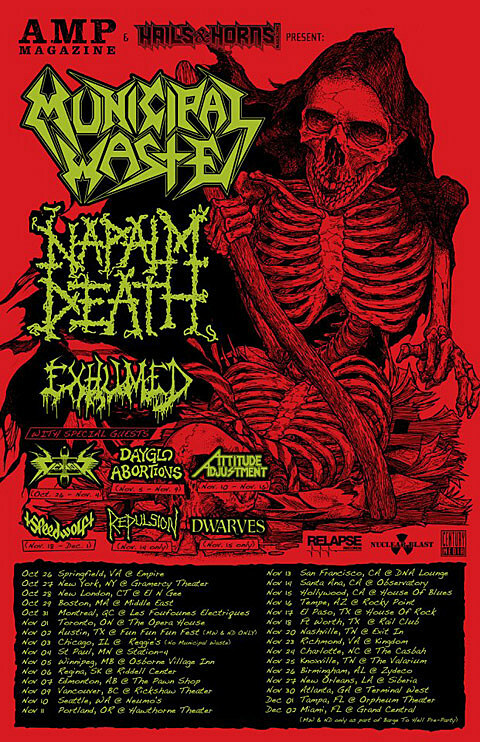 Municipal Waste, Napalm Death and Exhumed will team up for a US tour together (! ), calling on a rotating support cast of Vektor (who just played Saint Vitus), Dayglo Abortions, Attitude Adjustment, Speedwolf, Repulsion (who will play POTR East) and Dwarves. Look for them to hit Fun Fun Fun Fest along the way, and NYC is in the crosshairs for this mammoth tour, hitting Gramercy Theater on October 27 with Vektor on board as support. Tickets are on sale, and tour flyer and all listed tour dates are at the bottom of this post. Municipal Waste released The Fatal Feast earlier this year, while Napalm Death released Utilitarian. 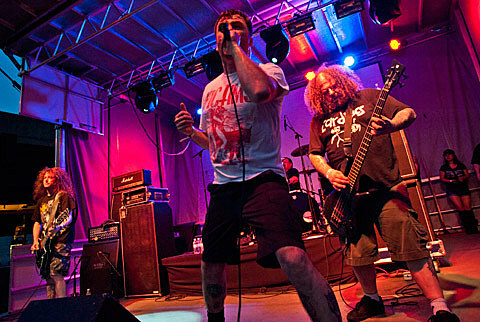 I interviewed “Barney” of Napalm Death earlier this year if you missed it as well. Meanwhile, Blag Dahlia of Dwarves will be in NYC very soon. All dates and the MWaste tour flyer are below.